According to the kinetic theory of plasma waves (Sect. 8.3) the electromagnetic fluctuations in a given initial configuration (f (0) a , E 0, B 0), after an initial transit period, will consist of a spectrum of normal modes at different wavenumbers, see (8.3.42). In the following we will discuss the resulting plasma waves for different assumed initial configurations of magnetized plasma. 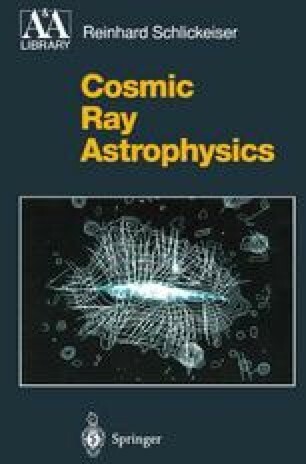 After treating plasma waves in cold and hot plasmas in this and the next chapter we are ready to investigate the situation characteristics for cosmic rays in space plasmas, where relativistic cosmic rays co-exist with a background interstellar or intergalactic plasma.